My daughter-in-law, Katie, started a beautiful collection of oyster plates. That just thrilled me as I now have a mission of finding wonderful plates for special occasions. When I first starting looking for them, I was amazed at the variety of designs and colors. In the current issue of Louisiana Cookin’, our team presented a beautiful article on oyster plates that I am sharing with you. Haven’t goddesses always had a taste for fancy vehicles? Aphrodite, whose job was steering both lovers and sailors, first made her way to shore riding in a giant mollusk shell. What happened to the bivalve she dislodged is not recorded, but if her many devotees in the ancient world give us any clue, she probably ate it. The Greeks were mad for oysters, and one of the earliest non-Biblical recipes we have is from the Athenian poet Philoxenus in the fourth century BCE, extolling a supper of fried oysters. Mosquitos notwithstanding, the bard would undoubtedly have reveled in a visit to our barely more modern Louisiana. Those Ionians also had a custom of saving a few cleaned out old shells (called ostrakon) and periodically scribbling on them the names of undesirables they wanted to boot out of Athens. Thence we get our word ostracism. Later the fondness for oysters by serious gourmandizing Romans reached such a pitch they marched across Europe and even tried to teach the backward tribes of Gaul (now France) how to cultivate oysters along the shores of the Mediterranean. Those beds just below Montpellier still exist today near Bouzigues. I sometimes think the reason Romans really strayed to England—for why else would they, given the quality of food and wine—was to export Colchester oysters in snow-filled baskets back to Rome for special feasts. While those in togas were relishing oysters, pre-historic Native Americans had been harvesting the fertile warm-water beds along the Gulf Coast at an astounding rate for many centuries. Their refuse heaps, called middens, can be found from Mississippi to Texas, with piles of oyster shells sometimes as vast as 20 feet deep and 200 feet wide. Certainly the oyster was a favored subject in Western art. From the Renaissance on, its depiction was a metaphor for nature’s abundant riches. Oysters were indeed so plentiful that one source claimed there were more than 4,000 oyster sellers in Paris alone at the beginning of the 18th century. It is interesting that when readily available (and thus not very expensive) oysters seem to have been eaten simply, without ceremony or pomp. The great painting Déjeuner d’huîtres (by Jean-François de Troy in 1735) was meant to hang in the young Louis XV’s first dining room. It shows highborn gentlemen around a table having a great time drinking Champagne and eating oysters piled on pewter plates. Shells are scattered on the table and spilling out of seaweed-lined baskets on the floor, with nary a specialized implement in sight. There is an early 17th century painting of Winter in the Munich museum, which offers a tantalizing suggestion on this subject. A buxom figure, her table set with sweetmeats and oysters, wields a small two-pronged utensil, but I think it was a sucket fork for eating gooey candied fruit. Essentially it isn’t until the end of the 18th century that we find real examples of oyster forks. There is a silver-gilt pair of shellfish forks marked 1778, conveniently fashioned with a small curved knife at the end, in the Wentworth Collection of the Metropolitan Museum. The earliest oyster forks I have found are French, and date from the first quarter of the 19th century. They almost always have ivory or ebony handles, are quite delicate, and have only two or three curved tines. Not until the 1880s did the shellfish fork become de rigueur in commercially-produced matching silver sets. Other pieces of culinary equipment, well-documented, include the fancy buckets of oak or mahogany and bound with brass or silver, in which oysters were carried into eating rooms. 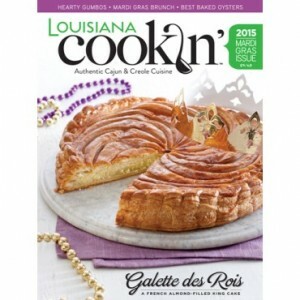 To read the rest of the story, pick up the January/February issue of Louisiana Cookin’. 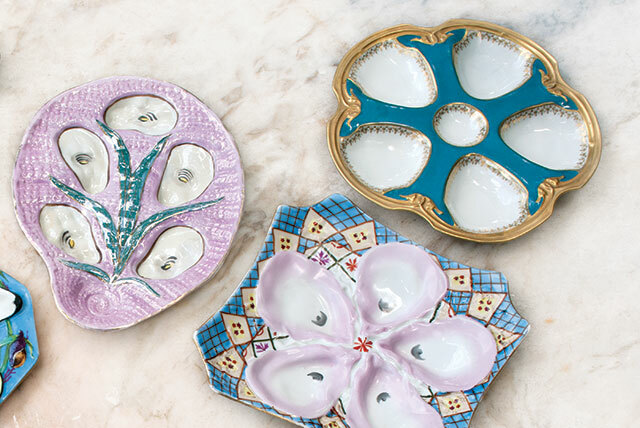 Do you collect oyster plates or other decorative antiques? I’d love to hear about them! I love oyster plates and your daughter’s collection is beautiful. I understand that according to “The Southerner’s Handbooks” by David Dibenedetto no Southern home should be without some. I started collecting them last year at Pennsylvania’s Antique Extravaganza. We go every year the last weekend in April. Looking forward to adding more to my collection! Thank you for sharing. Here comes this journal entry article about oyster plates and forks immediately following a lunch of oyster stew I made today. How delightful! The round oyster plates with the little pockets remind me of Seder plates, somewhat. My late Mother-in-Law’s silver service, which we inherited long ago, includes a set of six sterling seafood forks, dainty and elegant and eloquent. I love using these on occasion. I was not familiar with oyster plates before, but they are certainly lovely. Thank you for introducing me to them! The oyster plates are beautiful. Having grown up on the Chesapeake Bay, they were staples in my fathers home. The collection displayed really is lovely-Thank you! I began finding oyster plates after seeing a gorgeous display of them at the Monteleon Hotel in New Orleans. I just had to have some. Beautiful oyster plates! I love them and have a few but do not collect them. I would but have to stop and not have anymore collections. 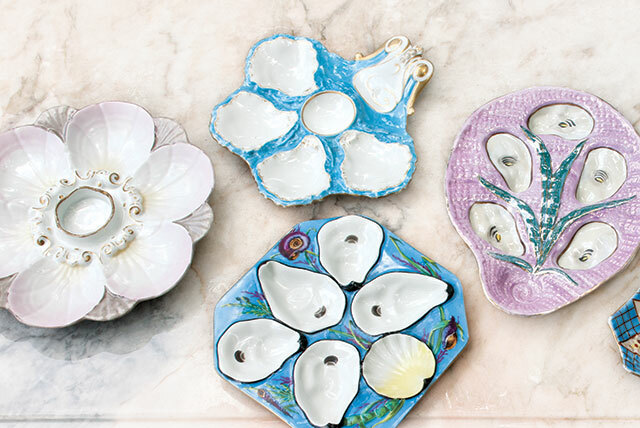 Oyster plates are amazing and so decorative. I enjoyed reading the story you posted. 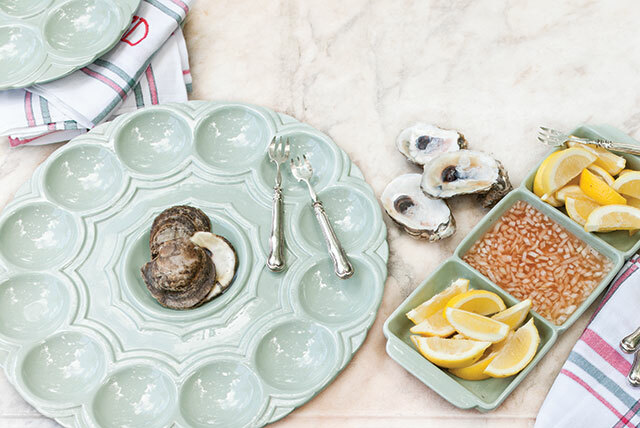 Bring back the oyster plate for dinner! 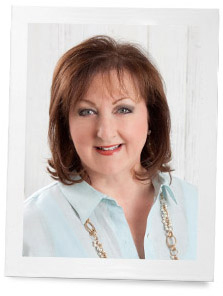 Hi Jayne, so sorry to hear that! We just tested on our end and everything seems fine. What error message are you getting?